Fashionable ladies at the races. Photograph by Horace Nicholls, reproduced with kind permission of the Horace Nicholls Estate. 17 February, 2017 marked the 150th anniversary of the birth of an important and yet comparatively little-known British photographer. Perhaps more than any other photographer, Horace Nicholls has shaped our perception of Britain during the first decades of the twentieth century. Even though his name is probably unfamiliar, you will almost certainly recognise his iconic images of fashionable upper class ladies at Ascot or, in stark contrast, women munitions workers during the First World War. During the early twentieth century, Horace Nicholls was one of Britain’s best known photographers. As one of the first photojournalists, Nicholls’s work shaped that of succeeding generations. Nicholls photographed the 2nd Anglo-Boer War in South Africa. He clarified legal copyright in photographs in a landmark court case in 1901. He photographed Edwardian social and sporting events and documented the impact of total war on the British people. As Britain’s first official photographer on the Home Front, he had unique access, particularly to women war workers. After the war, at the invitation of the Women’s War Work Sub Committee, Nicholls became the first head of the new Imperial War Museum’s photographic studio where he worked to secure and develop the museum’s photographic collections. These five words, which have struck fear into the hearts of many, seem oddly out of place in the Wellcome Collection’s impressive Reading Room. It’s not just the location, rather that all participants including five from the IWM’s Second World War Galleries team, are wearing false moustaches. How better to get into the mind-set of a would-be British Army officer in 1942? To celebrate the opening of the Tavistock Institute Archive papers on the War Office Selection Boards or WOSBs (pronounced wos-bees) at the Wellcome Library, a series of innovative workshops have been created to allow visitors to undergo the same military psychology tests that were used over 70 years ago. Although never kept a secret during the war, it has only been through the doctoral research of Alice White, and the meticulous cataloguing of the Tavistock Institute Archives by Elena Carter, that a wealth of information about the creation and development of the WOSBs testing programme has been uncovered. Co-created with Matt Gieve of the Tavistock Institute, these workshops will no doubt run for more than the initial four sessions planned. It was with great delight and pleasure that I received copies of my book, Dirty Wars: A Century of Counterinsurgency, which was published by The History Press on 6 October and will be published in North America in February 2017. This is the first book written for IWM by a member of staff to fully explore the origins and continuing importance and relevance of counterinsurgency. ‘Who is the enemy?’ This is the question most asked in modern warfare; gone are the set-piece conventional battles of the past. Once seen as secondary to more traditional conflicts, irregular warfare (as modified and refashioned since the 1990s) now presents a major challenge to the state and the bureaucratic institutions which have ruled the twentieth century, and to the politicians and civil servants who formulate policy. 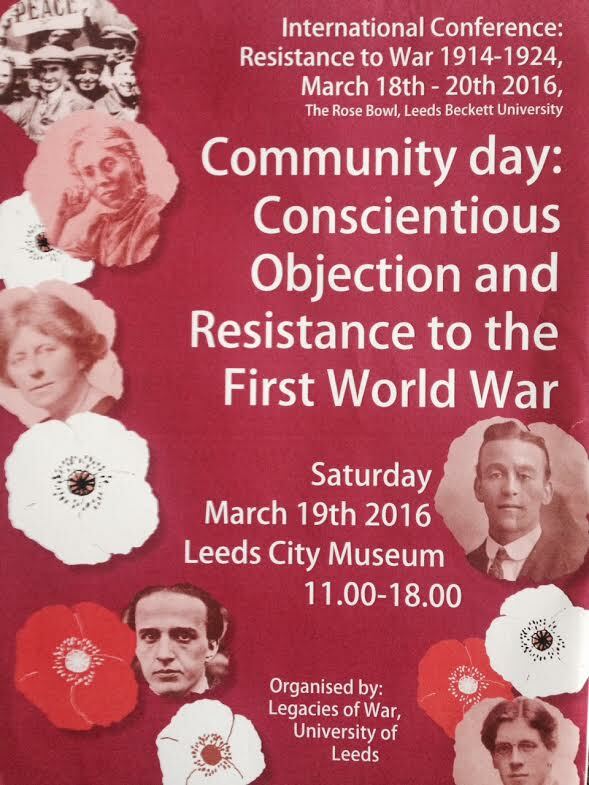 Over the weekend of 18-20 March an international conference took place in Leeds, focusing on resistance to the First World War. The conference, which I helped to organise, brought together academics, community groups, poets and storytellers from across the globe, including delegates who had travelled from Australia and the USA. The conference was envisaged following the suggestion that the prominent narratives during the First World War Centenary were limited to stories of those who had actively participated in the war effort. Stories of resistance to the war were missing from dominant narratives of remembrance and the conference sought to question what war resistance was, how acts of resistance were undertaken, and the significance of war resistance today. The presence of both academic and community focused research on resistance worked particularly well in addressing the many different facets of resistance; including the theoretical underpinnings of pacifism, international and transnational movements for peace, individual acts of conscious and unconscious resistance as well as national and local networks of resistance. On the evening of November 20 1983, 100 million Americans settled down to watch Nicholas Meyer’s made-for-TV film The Day After. The film’s focus was a familiarly normal community in rural Eastern Kansas in the lead up to, and aftermath of, nuclear war. It is shocking and arrestingly bleak viewing; moreover it was, and remained for years afterwards, the most highly rated TV film in US broadcast history. Its importance however, lies less in its status as a landmark media event than in what it demonstrates about the cultural imagination in the 1980s. The deterioration in relations between NATO and the Warsaw Pact raised for a new generation the meaningful prospect of nuclear apocalypse. The Day After is only one example of a notable manifestation of a contemporaneous burgeoning – and now largely forgotten – paranoia in the popular culture of the time. It’s my conviction – and the focus for my PhD research – that such fictional responses don’t just reflect the paranoia that was a product of the period, but that that they ultimately made a necessary and significant contribution to the eventual outcome. ‘As soon as the Iron Curtain came down’: when did the Cold War begin? East German construction workers, supervised by border guards, building the Berlin Wall, 1961. © IWM HU 73012. The official history of the Cold War holds that the military and political divide between Eastern and Western blocs was cemented in the immediate aftermath of the Second World War as allied relationships cooled. C Eliot Hodgkin, ‘The Haberdashers’ Hall, 8th May 1945’, tempera on panel, © IWM, Art.IWM ART LD 5311. June is the month when rosebay willow herb comes into flower, growing from derelict buildings, on wasteland and railway embankments across the UK. During the Second World War and in the following years, its spires of magenta flowers were common to see amidst the ruins and cleared bomb sites, hence the name it was given at the time – fireweed. Yet to flower in this painting of May 1945, the fireweed is depicted at the very forefront of the remains of Haberdashers’ Hall, Staining Lane, which was destroyed during one of the worst night raids of the Blitz on the 28/29 December 1940.